New Year’s Eve is also called Jaeseok or Jaeya. Because the syllable ‘Jae’ contains the meaning of “eliminate” or “erase,” Jaeseok or Jaeya often refers to “the day of erasing the past year.” However, “Jae” also refers to “the changing of a year,” so it can also be understood as the closing of a year. The term “Mangnyeon” carries not only the meaning of “forget,” but also, more broadly, “finish or exhaust.” Regardless, the most widely accepted connotation is that of losing the past year. It is necessary to remind ourselves that what we need at the end of a year is not the discarding of all the past events, but a time of closure, so we may conclude one period, and begin to prepare for a new one properly. On New Year’s Eve, in addition to the custom of staying up and lighting lamps all night, there was a lively tradition of making loud noises to drive out evil spirits before starting the new year. Though lighting the area brightly by itself contains the strong power of exorcising wicked spirits and darkness, noise was a more active measure. For that reason, among commoners, people burnt bamboo trees or pine branches to make loud cracking noises, rang loud bells, or shot children’s toy guns to chase out malicious spirits. During the late Goryeo Dynasty, a scholar named Gyobo Lee (1168-1241) mentioned it in his poem, “Susae,” that there were such loud noises in the yard, how about it! So we can assume that this type of custom was already popular by that time. In addition to that, to conclude a year, there were various customs for greeting the new year. From finishing all of one’s dinner to finishing all of the sewing tasks before a new year, people even tried to pay off their debts by the end of the day. If there were any debts left that couldn’t be paid off, it was common to avoid pressuring the debtors. From this, we can understand how people tried to greet a new year with a new mindset for themselves as well as for others. On that day, people bowed at their shrine and before elders. This was called the old year’s bow. The men of the house cleaned their home thoroughly inside and out, whereas women cooked the food to be used in the new year. In this way, people wanted to greet a clean and holy new year by clearing away any misfortune of the old year. In temples, various dharma talks were held, such as Songguyoungshin Beophoe, seeing the old year out and the new year in, Jaeya Doryang, a temple compound, and Posal Beophoe, confession or repentance before concluding a new year. In particular, a dharma talk on new year’s eve tends to have the characteristics of posal, confession or repentance, when one looks back over one’s conduct during the previous year. Praying for repentance along with making a new year’s wish, the dharma talk can be very meaningful, more than at any other times. Recently, the significance of this day has been revived through various programs in dharma talks. For instance, there is “The Thread of Suffering,” in Jogyesa Temple, where people can write down their worries or bad karma on paper and hang it up on the rope. These are burned on New Year’s Eve, wrapped in big cotton cloth during the ceremony while chanting the repentance mantra. 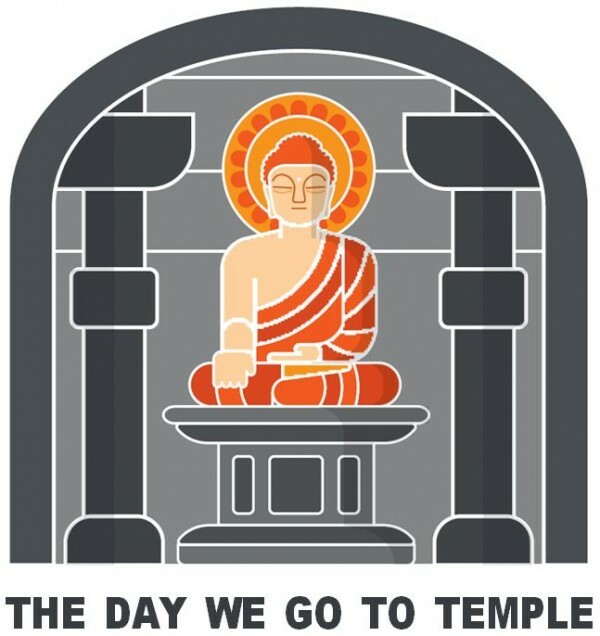 In Yakchunsa Temple on Jeju Island, people greet a new year through a compassionate confession prayer for three days by looking into one’s Buddha-nature and reflecting on one’s wrongdoings of the year, starting on the 29th. On the last day of prayer, on the 31st, starting with the evening ceremony, other traditions take place: the repenting prayer of oneself, the circling of a pagoda to make a wish, Pavarana, or confessing one’s transgressions, Posal, or eliminating one’s wrongdoings, and the ringing of the bell at the last moment on the last day of an old year, and on the first day of a new year in order to make the vow to renew one’s effort in the new year. On that day, Buddhists may greet the new year at home, lighting lanterns and reciting Gwangmyeong Dharani or the Mantra of Brightness. This is because the dharani is known for its miraculous power for lighting one’s mind from ignorance, removing all bad karma through the bright light of Buddha. According to Yeolyangsesigi, the Annual Events of Seoul, by a scholar named Maesun Kim (1776-1840), just past midnight on New Year’s Eve, the sound of Buddha chants by mendicants was very loud, startling people, who then gave offerings for the ceremony outside of their homes. It indicated that people realized the New Year had come, and reflected on themselves with the sound, though they were unaware of how much nighttime has passed while waiting for a new year. These days, to reverently greet the coming of a new year, the bell of Bosingak, the Bell Pavilion, is rung 33 times in Jongjak in Seoul on New Year’s Day. This tradition originated from the signaling of the curfew during the Joseon period (1392-1897). The bell was rung 33 times at dawn and 28 times in the evening. The 28 times signify the 28 constellations and the 33 times refer to the 33 heavens. However, in temples, they ring a dharma bell 28 times at dawn and 33 times in the evening. Though there are a number of theories regarding the numbers, it is a common notion that it has to do with the 28 heavens in three worlds: heaven, earth, and people. The world’s sentient beings go around Samsara, the wheel of life, which is divided into three worlds: the world of desires, the world of forms, and the world of formlessness. It is further subdivided to six heavens of the world of desires, eighteen heavens of the world of forms, and four heavens of the world of formlessness; in total, there are 28 heavens. Consequently, 28 times that the dharma bell is struck implies the beginning of a day to awaken the world, and the thirty-three times in the evening to signify Doricheon, consisting of not only the Heaven of thirty-three gods, but also one of the six worlds of desires. Doricheon at the summit of Mt. Sumeru is the residence of the King Sakra or Devas, who rules the mundane world. Thus, it holds the hope of peace and a sense of ease of the sentient beings towards the world of thirty-three heavens. In temples, striking a dharma bell carries the hope of attaining wisdom for sentient beings on land by getting rid of the afflictions of Samakdo, the three evil paths or realms. Thus, the resonating sounds of the thirty-three tolls of the bell on New Year’s Eve are Beomeum, the voice of Brahma, awaking a sense of ease and aspiration for the enlightenment of all living beings. * Please note that this writing is an excerpt from the book, "The Day We Go to Temple" and is contained in the winter 2016 edition of the Lotus Lantern magazine under Buddhist Culture Section on page 21~25.